Last night, former UND and rookie Edmonton Oilers forward Drake Caggiula scored two goals against the Vancouver Canucks. Caggiula's first goal was a result of being in the right place at the right time and picking up the change in front of the net. (Caggiula First goal) Caggiula's second goal was a thing of beauty. (Caggiula one-timer). The Edmonton Oilers received some very bad news today. Their star rookie forward Connor McDavid will be out long term after sustaining a upper-body injury. Can we say fractured collar bone? The video is painful to watch. This is bad news for the NHL and the Oilers. So far this season, McDavid is leading rookie scorers with (5g-7a--12pts) in 13 games. Connor McDavid expected to have surgery to repair fractured clavicle. You really can't argue with this. 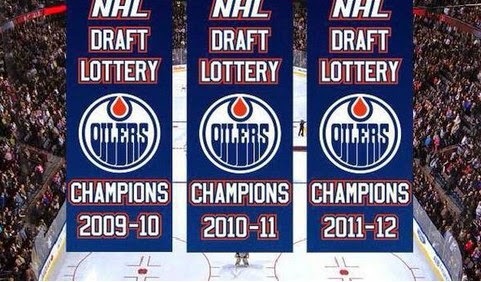 The Oilers have done nothing with all of the first-overall draft choices. I suppose this isn't funny to the fans from Alberta. If you haven't seen this hatchet job, check it out. Apparently, Benjamin Massey of Copper and Blue doesn't think very highly of former UND defenseman Dillon Simpson. Meh! I guess they're entitled to their opinion. Free country, Canada and the USA. Also, the staff at Copper and Blue seems to think that Simpson is an average player and nothing to get excited about. Whatever... In my opinion, Simpson was a very good hybrid defenseman that played well in his four season with UND. Simpson is a smart player that sees the ice well and looks to make the smart play, so maybe that can be interpreted as boring or average. Simpson also led the NCAA in blocked shots last season. Simpson was also one of the more consistent players in the NCHC last season. Dillon Simpson is what I like to call "a chunk of hockey player." He isn't very big. He isn't very fast. He isn't very truculent. He doesn't generate much offense. He plays at a respectable level. He's gotten some results, but not many. After four years at the University of North Dakota, Simpson looks like a refined version of the player that went in. He even majored in "managerial finance and corporate accounting", just so we know that there's nothing to get excited about. Our favourite average college defenseman/managerial financier and corporate accountant is starting his professional hockey career this season, having agreed to a three-year deal back in April. Good for him. He seems likely to play in Oklahoma City, a town just as interesting as everything else in this article. With hard work and good luck he'll have a career as a sort of Sven Butenschön, bouncing up and down between the A and the N, more in the former than the latter, before opening a used car dealership in Sherwood Park, retiring at 45 years old, and spending the rest of his days as a beloved local character deeply involved with charity and his community. In my three season of covering the UND hockey team, Simpson is one of the nicest guys that you will ever meet. I also think he was one of the more consistent players to play defense at UND in the last 5-10 years. Just for the record Bruce McCurdy of the Edmonton Journal has a much better description of Simpson's play. North Dakota will lose Dillon Simpson to graduation, and there is no doubt that his absence will leave a definite void. The senior captain appeared in 156 games in the North Dakota sweater, potting 16 goals and notching 59 assists. He led the nation in blocked shots this season (109 in 42 games) and was recently named to the All-College Hockey News first team. There is no way that UND can replace that type of leadership with just one player. This should have been more than a one-game suspension. This is ridiculous. There's no sense to this crap. You can't just punch an unsuspecting player like this. It's a violation of the hockey code. A one-game suspension for this barbaric act is absolute joke. Unacceptable! I don't care what the Oilers defenseman Jesse Jensuu did, if you want to fight him, challenge him to a fight. Someone tell my why Oilers forward Matt Hendricks isn't given a penalty on this play? Hendricks clearly hits Wild defenseman Nate Prosser from behind in the numbers. Apparently, an unhappy Edmonton Oilers fans threw their Oilers jersey on the ice after Saturday’s 6-0 loss to the St. Louis Blues. The Edmonton Oiler head coach Dallas Eakins has caused a fire storm when he said this. This will probably blow up ever more as the day progresses. Clarity. Today my passion for our Jersey was clearly on display. Our Jersey is sacred and the passion for it will never calm. My comments were intended to show that we will continue to try and emulate our citys hard working, blue collared approach. We will continue to fight to get better… No matter the circumstance. Check out this dirty goal by Chicago Blackhawks captain Jonathan Toews as he puts on the how's it going on Edmonton Oilers goalie Devin Dubnyk. I guess, I will go cut Dubnyk from my fantasy team so he can go find his protective cup that Johnny faked him out. Ouch! Not a good hit, actually, this is a very dangerous hit by Washington Capitals forward Jason Chimera on former Wisconsin Badger and Edmonton Oilers defenseman Justin Schultz. I would call this a push check. Chimera only received a two-minutes penalty for his efforts. Schultz appeared to be okay. GRAND FORKS, N.D. – University of North Dakota Men’s Hockey Coach Dave Hakstol announced today that senior defenseman Dillon Simpson has been named team captain for the 2013-14 season. Hakstol also announced that junior forwards Michael Parks and Stephane Pattyn will serve as assistant captains. Simpson, a native of Edmonton, Alberta, has collected nine goals and 43 assists in 114 career games. Last season he was named UND’s Most Improved Player after leading the team’s defensemen with a career-high five goals and 19 assists in 42 games. In his three years as a collegian, Simpson has helped lead UND to three straight NCAA regional championship game appearances and a 2010-11 berth in the NCAA Frozen Four. A managerial finance and corporate accounting major, Simpson was a three-time All-WCHA Academic Team selection and a two-time WCHA Scholar-Athlete. He was a fourth-round draft pick (92nd overall) of the Edmonton Oilers in 2011. Simpson’s father, Craig, won two Stanley Cups with Edmonton during a 10-year National Hockey League career that also included stops in Pittsburgh and Buffalo. Parks, a native of St. Louis, Mo., was UND’s Rookie of the Year in 2011-12 when he collected 12 goals and 10 assists in 42 games. Last season he scored seven goals and one assist in an injury-plagued season that limited him to just 25 games. A general studies major, Parks has received UND’s Engelstad Family Foundation Endowment in each of the last two seasons. He was selected by Philadelphia in the fifth round (149th overall) of the 2010 NHL draft. Pattyn, who hails from Ste. Anne, Manitoba, has missed just one game through his first two seasons at UND, amassing six goals and five assists in 83 games. Last season, both of Pattyn’s goals came against top-12 opponents, while three of his four goals as a freshman in 2011-12 were game-winners. An entrepreneurship major, Pattyn has previous captaincy experience having served as team captain for Portage in the Manitoba Junior Hockey League in 2010-11 before arriving at UND. UND takes to the ice for the first time on Sunday, Oct. 6, when it hosts the University of Manitoba in exhibition action. The regular season begins the following weekend when non-conference foe Vermont visits Ralph Engelstad Arena Oct. 11-12. Here’s what the Edmonton Journal had to say about UND senior defenseman Dillon Simpson. Jonathan Willis, Edmonton Journal – Dillon Simpson was a good enough player to contribute in college hockey’s toughest conference, the WCHA, at the age of 17. For the sake of perspective, current Oiler Jeff Petry was two years away from college at that point, still playing in the USHL. Since his draft year, Simpson has seemingly made steady progress in all areas of his game. The statistics at the college level don’t tell us a lot about a defenceman, but we’ll start there. Once again Simpson was highly reliant on the power play for his offence – 14 of 24 points came with the man advantage. After scoring seven points at even-strength as a rookie and seven last year, he upped his production to 10 points this year – not bad, but hardly breathtaking. He’s been a reliable plus player on a good team, though his plus-5 rating this year (against the backdrop of a team that went plus-29) was less impressive than last year, perhaps reflecting more challenging assignments. Also, former MTU forward Jujhar Khaira has moved up the ladder in the Edmonton Oilers system. Michigan Tech got some bad news yesterday when the school announced that sophomore forward Jujhar Khaira wouldn't be returning for his sophomore season and he would be forgoing his final three years of eligibility to sign a professional contract with the NHL’s Edmonton Oilers. According to the release by Michigan Tech, academics was not a factor in his decision to leave school early, he sported a 3.38 GPA. Khaira scored (6g-19a—25pts) in his only season with the Huskies. I guess there is nothing unheard of in today's world of social media. No clue, if Nail Yakupov was able to get the Edmonton Oilers attention. Last week, was a tough week for hockey. While we morn the passing of former Colorado College Tiger forward Scott Winkler. Last week, we also got word that Edmonton Oilers prospect Kristians Pelss had drowned in Latvia. Joanne Ireland, Edmonton Journal - For days Josh Green held out hope that Kristians Pelss had not drowned, that it was just a horrible coincidence that he was missing and that someone else had jumped into the Daugava River in Riga, Latvia. Sadly, the search came to a tragic end on Saturday when Pelss, a 20-year-old Edmonton Oilers prospect, was confirmed dead. “When I heard the initial reports, I was absolutely floored. You just feel sick to your stomach but you keep hoping for a miracle. It’s so sad,” said Green, the captain of the Oklahoma City Barons. Travis Ewanyk spent two seasons with Pelss in the Oil Kings fold, a memorable stretch that included the team’s Memorial Cup run in 2012. Ewanyk then closed out this season with Pelss in Oklahoma City. He had many conversations with Oil King teammates and coaches over the course of the past few trying days. It was pretty obvious that the Edmonton Oilers were taking runs at Zach Parise during the third period of last night's game. I guess when you're a team that isn't going to make the Stanley Cup Playoffs, you might as well try to hurt the other team's star players right. I guess your team can still have an effect on the outcome of the playoff field right? Finally, after Corey Potter took yet another run at the Wild's Parise, Wild tough guy's Zenon Konopka and Mike Rupp had seen enough and went after the Oilers much traveled Corey Potter. Before Rupp could get at Potter, he was rescued by the linesman. According to Michael Russo, Mike Rupp will not face any additional supplemental discipline. This is a good decision by the NHL Department of Players Safety. The Eastern teams are set, it's just a matter of who will play who. If the Minnesota Wild win their game against the Colorado Avalanche tonight, they're in playoffs. If not, their season will go down as a massive choke job, especially with who they added in the offseason. Last night's 6-1 loss to the Edmonton Oilers was painful to watch. Is Nail Yakupov’s goal celebration over the top? Check out this goal by Edmonton Oilers rookie forward Nail Yakupov. There is a school of thought that the NHL is starting to look like the European soccer leagues with some of the over the top celebrations of the players after they score a goal. I don't know what to think... I don't like showing up an opponent. I get it the kid is excited as well. Alexander Ovechkin took some heat after he scored a goal and then dropped it to the ice and acted like it was too hot to pick up. Dillon Simpson from boy to polished defenseman… UND’s defensman steps up to make major impact on team. This is what I wrote for the Hockey Writers - Combine. University of North Dakota Junior defenseman Dillon Simpson accelerated his high school studies to come to UND at a very young age of 17 years old. His first season with UND, Simpson could have been attending high school with kids his own age instead of playing in a league full of 20 year old men. Simpson was drafted in the fourth round, 92ndover-all in the 2011 NHL entry level draft by the hometown Edmonton Oilers. has Simpson listed as a project. Simpson is a project in the purest sense. It’s unlikely he leaves school early, barring an incredible jump in production, so it won’t be clear where he fits for a couple years. This season has kind of been a coming out party for the young defenseman. This season, Simpson has shown us a peak of what we can expect from him in the weeks to come. On the ice Simpson’s play oozes with confidence. Head coach Dave Hakstol had this to say about Dillon Simpson’s play during the last series and more specifically last Saturday Night. “I thought this past Saturday especially in a game where we weren’t happy with a lot of things – there were very many things that we did. I thought he was one guy that continued to play at a real efficient level. We’re happy with his play – he’s made a nice step forward from where he was as a sophomore and he has held that level of play at a pretty consistent level. So there have been a lot of positive signs for him. Coach Hakstol on whether Dillon Simpson is physically stronger this season. He’s stronger, he’s more mature, Hakstol said. You always have to remember that everyone’s body matures at a different age. But also, Dillon’s a junior but he just turned 19 years old, he’s a young junior. I think what we’re starting to see is some of that physical maturity starting to kick in and that combined with a lot of the hard work that he has put in over the last couple of years you’re starting to see the payoff of that added strength and improved conditioned levels and that usually leads to an improved level of consistent play. Coach Hakstol was asked whether junior defenseman Dillon Simpson has improved dramatically from last season. I believe the sky is the limit with Dillon Simpson and as his play improves, his minutes increase and so does his points total. In case you were wondering, Dillon is the son of former NHLer, Hockey Night in Canada television broadcaster and MSU Spartans Alumnus Craig Simpson.